Arctic Strategy discussing application of its traditional missions to the polar envi- ronment. United States extended continental shelf. As this area lies on the fl oor of the Arc- tic Ocean more than 200 nautical miles north of Alaska, surveys are almost im- possible without the assistance of a polar icebreaker. U.S.-fl agged ice-capable ships provide visible U.S. sovereign maritime pres- ence throughout the Arctic region. 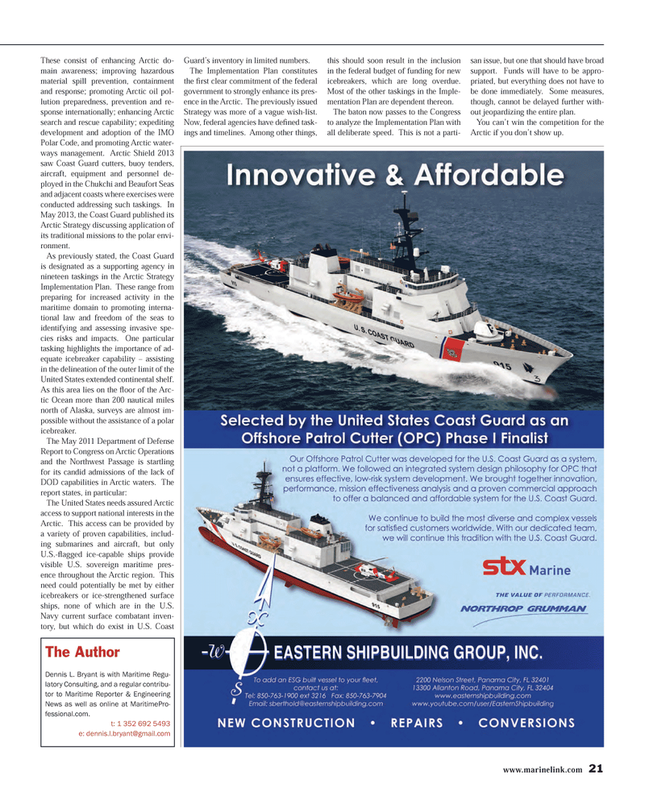 This need could potentially be met by either icebreakers or ice-strengthened surface ships, none of which are in the U.S.
Guard’s inventory in limited numbers. Strategy was more of a vague wish-list. Now, federal agencies have defi ned task- ings and timelines. Among other things, this should soon result in the inclusion in the federal budget of funding for new icebreakers, which are long overdue. Most of the other taskings in the Imple- mentation Plan are dependent thereon. The baton now passes to the Congress to analyze the Implementation Plan with all deliberate speed. This is not a parti- san issue, but one that should have broad support. Funds will have to be appro- priated, but everything does not have to be done immediately. Some measures, though, cannot be delayed further with- out jeopardizing the entire plan. Arctic if you don’t show up.